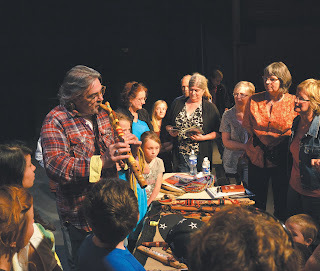 On Tuesday June 21, David Bouchard plays one of his many flutes for a crowd that gathered after the end of his two-hour presentation to listen to more of his songs and stories. Bouchard performed in the Valemount Community Theatre at Valemount Secondary School to an attentive audience following an outdoor potluck dinner. Bouchard’s Métis spirit name is Zhiibaayaanaakwad which means roughly…”“Eagle who flies in and out of the clouds bringing messages from Creator”. A bright warm sun broke through the clouds when famous Métis author and Order of Canada recipient, David Bouchard, arrived in our Valley on June 21, which also happened to be Aboriginal Day across Canada. Outside Valemount Secondary School (VSS), many Valley residents gathered to enjoy a community potluck with David Bouchard. An authentic teepee had been set up and enjoyed by the children who attended. “I expected more mosquitoes, “ Bouchard joked when opening his evening presentation, held at the Community Theatre at VSS. Moments earlier, as the audience was seating themselves, beautiful melodies filled the theatre as Bouchard expertly played one of his many flutes. It had been a long road that led Bouchard to our community theatre on Aboriginal Day. “This year alone, since the first of February, I’ve travelled 62,000 miles. In the last 11 years it’s for sure been a million miles,” Bouchard told The Valley Sentinel, speaking to us before the show. Bouchard told us that he has likely been snowed-in in every remote community in Canada, including with a “big white ugly cook” in Natuashish in northern Labrador. “I’ve met a lot of interesting people and learned a lot of interesting stories,” Bouchard said of his many travels. “The most significant thing I’m doing in my life is what I’m doing now,” Bouchard declared. He said it took him 25 years to learn to become a better father and teacher. It started with him progressively watching his own son’s struggle and coming to realize the importance of reading. “My sons don’t read because I wasn’t a good father, I just didn’t know,” Bouchard explained. He quoted famous author Maya Angelou who said, “Parents who know better, do better.” He said he realized the power he has to make change happen and decided to use that power as a school principal. Part one of his destiny was realized. Part two of Bouchard’s journey came with the realization of his Métis ancestry. “It dawned on me that maybe I was put here for a reason, maybe my Grandmothers were waiting for the time to be right for me to be mature enough, to be ripe enough, to guide me,” Bouchard said. He believes that the reason Aboriginal people are not readers is because they don’t see themselves in books. “The good news is anything can change,” Bouchard said. Bouchard noted such famous aboriginal authors as Joseph Boyden, who won the 2008 Giller Prize for Three Day Road and Drew Hayden Taylor, the Ojibway writer of Motorcycles & Sweetgrass. “I have a mission to write cultural books that will be of interest to all ages and I am trying to include as many nations as I can,” Bouchard declares. Bouchard explained that he changed to a publisher who agreed to print his books in native languages. “My dream is to get books in as many of our languages as I can, there are at least 62 living languages in our country,” Bouchard explained. Bouchard has authored 52 books. “I have... maybe 10 in the fire,” said Bouchard. Bouchard’s presentation held the audience spellbound for its two-hour length during which he demonstrated the different melodies his various flutes made, demonstrated to the children of the audience the importance of reading through the telling of stories and explained the key to becoming good reader. “To become a reader, find one book you like and then one more and one more. That is why I like series like Harry Potter and Twilight,” Bouchard told the audience. Even when the presentation ended many members of the audience joined Bouchard on stage to speak with him personally, learn more of his beautiful flutes and to perhaps squeeze just a little more knowledge from such a wise man. Particularly obvious was the ease the children had speaking and interacting with Bouchard. Local First Nation Elder, Mae Frye, was impressed with the presentation. “I really enjoyed the show, especially the attention he gave to the kids, and how he encouraged them to read more books and watch less television. I think that was my highlight. He is a very good storyteller. Storytelling, I think, is very important,” said Frye. David Bouchard discusses the struggles Métis children have in learning to read.